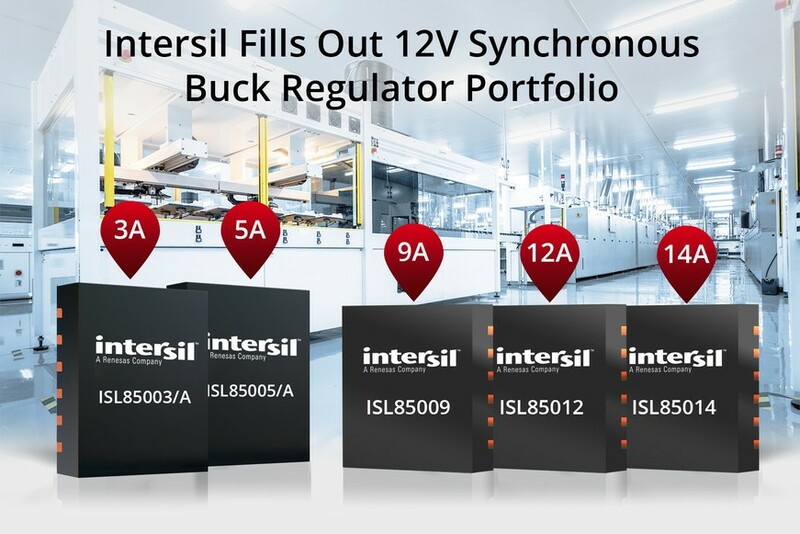 Milpitas, Calif., April 3, 2017 – Intersil, a subsidiary of Renesas Electronics Corporation (TSE: 6723), today introduced five synchronous buck regulators that step-down 12V rails to point-of load inputs as low as 0.6V for MCUs, FPGAs, memory and peripheral I/Os. The newest members of the ISL850xx family consist of the ISL85014, ISL85012, ISL85009, ISL85005A and ISL85005 buck regulators. They deliver 14A, 12A, 9A and 5A of continuous output current, respectively, to industrial computers and programmable logic controllers as well as telecom, test and measurement, server and storage networking equipment. The ISL850xx sync buck regulators support input voltage of 3.8V to 18V and wide output current range, offering designers a complete portfolio of devices with high efficiency and reliable performance. The pin compatible regulators integrate very low RDSon high side and low side MOSFETs that reduce external component count and power loss to extend product life. Both FETs also provide current limit and reverse current limit to boost reliability and protect the system during an overcurrent event. The high efficiency ISL850xx devices enable lower die temperatures, allowing systems to operate without cooling fans or heatsinks. Their internal compensation eliminates additional external components, which reduce design complexity and bill of materials (BOM) cost. Watch a video on Intersil’s 12V synchronous buck regulators. The ISL85014 is offered in one of the industry’s smallest 14A packages at 3.5mm x 3.5mm, offering a compact footprint to free up valuable board space. The ISL85009 is one of the industry’s most power efficient 9A sync buck regulators, offering high side FET RDSon at 17mΩ and low side FET RDSon of 8.5mΩ to dramatically reduce die temperatures for applications without cooling systems. The pin-compatible ISL85014, ISL85012 and ISL85009 address high load current applications, while the 5A ISL85005A and ISL85005 buck switching regulators are pin-compatible with the previously released 3A ISL85003A and ISL85003 devices. "Design complexity is growing, prompting power supply designers to look for highly integrated, feature-rich buck regulators that not only offer small size, but deliver high efficiency, fast transient response and ease of use," said Mark Downing, senior vice president of Infrastructure and Industrial Power products at Intersil. "Our family of pin-compatible 3A to 14A synchronous buck regulators gives customers all the features they need in a small, layout friendly footprint." The ISL850xx family of buck regulators can work alongside the ISL68127 and ISL69124 digital multiphase controllers and ISL99227 smart power stages to support networking auxiliary output rails with high efficiency and compact size. They are also well suited for two stage 12V to 5V/3.3V rails working with Intersil’s 5V sync buck regulators such as the 6A ISL8026, dual 3A ISL8033, and 3A ISL80030/31. The ISL850xx 12V sync buck regulators are available now in 12-lead DFN and 15-lead TQFN packages with pricing from $0.75 USD to $2.35 in 1k quantities. For more information and to order evaluation boards, please visit: www.intersil.com/12v-buck-regulators. Designers can use Intersil’s PowerCompass™ tool to quickly identify the ISL850xx regulators and other parts that match their specific requirements, set up multiple rails that also support FPGAs or processors, perform high-level system analysis, and generate custom reference design files.